Nikon’s all-new Spot On™ Ballistic Wind Meter plugs directly into the headphone port found on almost all smart phones. The Spot On Wind Meter takes an accurate reading of the wind speed and direction and inputs the data directly into the Spot On Ballistic Match Technology™ Application that every serious hunter and shooter should have on their smart phone. Now, the Spot On app not only provides the precise aiming point on your reticle to compensate for distance, but thanks to the new Spot On Wind Meter, you now can also compensate for wind drift. Download Nikon’s Spot On Ballistic Application – free for iPhone, iPad and Android. Plug the Wind Meter into the head-phone port on the phone and open up the Spot On app. Choose your model of Nikon riflescope, caliber/load, sight-in distance and target distance. Click “Atmospheric Conditions” and input your local conditions. Capture your current wind speed by holding the Wind Meter facing into the wind. Select the wind direction relative to your target position and set the app to display the wind drift on your reticle in either clicks, inches or MOA. As you can see, the Spot On Ballistic Application not only shows you your hold-over points as they pertain to bullet drop, but now shows you the number of clicks to adjust your scope to compensate for Wind Drift. The wind speed is in a constant state of change and it is important to have the current reading right before taking your shot. Although any amount of wind can have a bearing on the point of impact, stronger gusts – especially cross winds – will have a more significant effect on the trajectory of your bullet. The direction in which the wind is blowing will have a bearing on how much effect it has on bullet trajectory. A cross wind – meaning a wind that is blowing perpendicular left or right – will have the most effect on the bullet while a wind that is blowing in at an angle will have a less severe effect. A head wind or a tail wind will have very little effect. 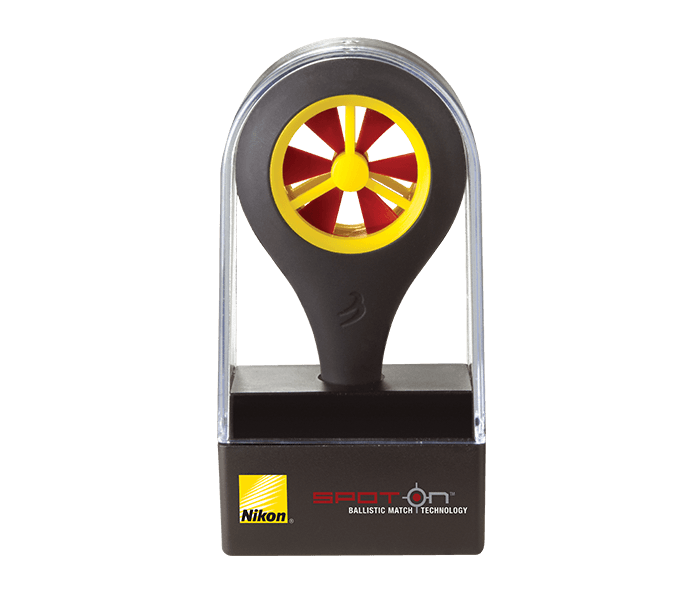 The Spot On Ballistic Wind Meter only provides the wind within close proximity to the shooter. Although the wind downrange can effect the trajectory of your bullet, the point of impact is most effected by wind gusts that occur closer to the shooter because the shift in trajectory is amplified in accordance with the amount of distance the bullet still has to travel before impact.